The new E3 Triple 2 dynamo light illuminates the trails with three well-cooled CREE power-LEDs brighter than any other dynamo light on earth and even literally outshines most battery-powered lights. This is made possible by the ingenious electronics that uses the power of the generator with optimal efficiency at all times. If you see the E3 Triple at full speed, you will not believe it is powered by a dynamo! The E3 Triple 2 was developed for 24H MTB-races and is used successfully by the Supernova Racing Team. Even Olympic gold medal winner Bart Brentjens and his 4-man team put their faith in the E3 Triple at the 24-race of the Nuerburgring, Germany, winning the race with this dynamo light. The newest version of the Triple is now 40% brighter than its much lauded predecessor, thanks to three CREE XM-L2 LEDs! This could be the ultimate bike light. Use night and day with the back light. In winter with the sun low in the sky a strong light helps you to be seen. At night you see all the road ahead as clearly as you do in day time. -Does the light come with the mount photographed? Is that the only mount available in the box (it says multimount in the description)? - The off-road lenses, are they an attachment? I planned to use this for a road race, are there any equivalents or this will do fine? Yes, the light comes with the mount photographed. It is the only one in the box and I do believe it multi mount . To my knowledge, this light been designed for road and MTB races. The light comes as depicted in a photo. NB It is not road legal (in Germany). Hi, does this have an on off switch and if so can the standing light be turned off immediately? Also this still compatible with a SON Dynamo on a Brompton? Thank you for your time. Yes this has an on/off switch, and yes, turning it off will turn the light off regardless of stand light. This will go on a Brompton fine, but can only be used with Supernova rear lights. What Do You Do With The Rear Light Cable If You Don'T Run A Rear Light? It looks like the rear light cable is permanently attached. What is the recommendation if you don't want to run a dynamo rear light? If you think there is even a small possibility that you may want to run a rear light in the future your only option is to cut the rear light cable down slightly (not too short) and find a way of tucking it out of the way. If you definitely don't want to ever run a rear light you can cut the rear light cable flush to the light. Unfortunately neither are the neatest solutions but they re the only options I'm afraid. Will This Light Work With The E3 Rear Light? Hi, yes this will work with the Supernova E3 rear light. Is This Light Efficient/Effective With Son Deluxe 12 Fitted To Road Bike With 700 Wheels? The dynamo is rated 6v3W and the light suggests it provides 640 lumen @ 4.5W. Does this mean the full benefit of the light would never be achieved and a less powerful alternative may be better? This light will be fine for use with your hub dynamo. 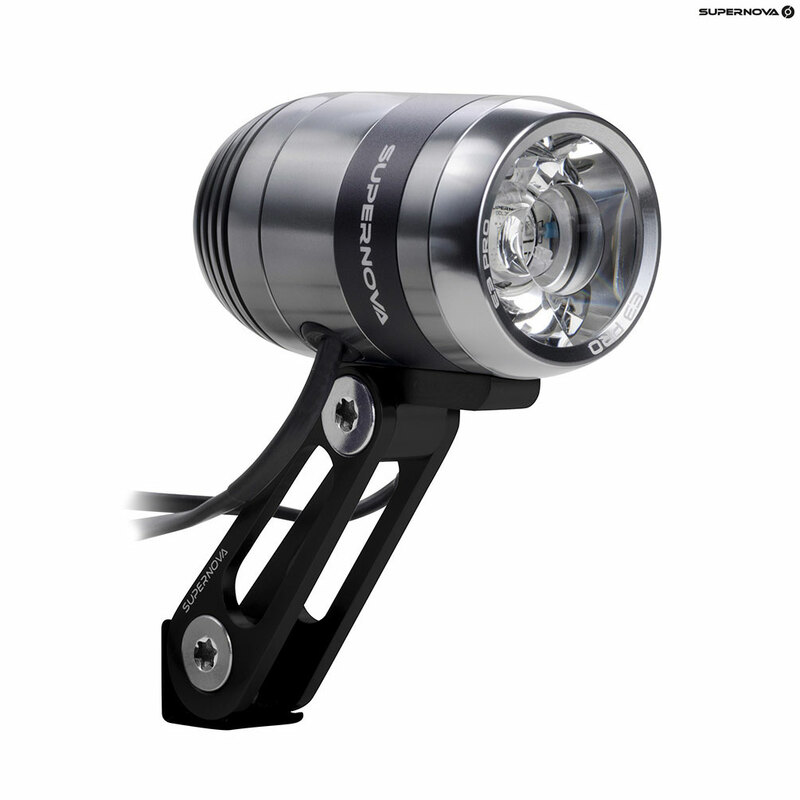 Almost all hub dynamos produce 6V3W so this light will work as well as any other dynamo light with your hub. You should be able to achieve full power from the light without any issues. I've got a disc-brake fork with only an under-crown bolt. Will this light work out of the box, or is there another mount I'll need to fit it? This won't work straight out of the box I'm afraid, the supplied bracket is designed for a front facing crown mount. If you have a normal open steerer under the crown then there is a bracket to fit there, these are SJSC part 23930. If you have a closed base of your crown with only a single bolt then there is not a bracket available for that fitting I'm afraid so you may need to look into a custom bracket. Will This Work With A Son Hub On A Brompton? If so, does it need a special bracket for the Brompton? This light will work with a Son hub for Bromptons. You will require a separate bracket as the standard one supplied would interfere with the Brake on a Brompton. These replacement brackets are SJSC part 31203.